Kolmanskop was once one of the wealthiest towns in the world. Diamonds were so plentiful that they could be picked up off of the ground, even at night, when they twinkled in the moonlight. German miners came and built a town on the edge of the Namib Desert, and there, on the rough edge of civilization, they had virtually every luxury their diamond fortunes could buy. May 2017, panorama from 3 vertical images, additional exposures for highlights, focal length 16mm, aperture f/11, shutter speed 2.5 seconds, ISO 64, tripod. The history of Kolmanskop began in 1908 when a railway worker, sweeping dirt and debris from the tracks, found unusual stones. He had unwittingly stumbled upon one of the richest diamond deposits in the world. The town that became Kolmanskop grew at a frenetic pace. Diamond hunters descended on the area, and, buffeted against the wind and sand, set to work on all fours, picking diamonds out of the sand and putting them in jam jars. They coaxed a town of the desert, and because it was essentially a German town, it had German-looking houses, a school, a gymnasium, and a pub. But this wasn’t an ordinary German town. Kolmanskop was wealthy — in 1912 alone, one million carats of diamonds were found there. The town had fresh water brought in by rail and electricity at a time when many towns in Germany didn’t have it. There was a swimming pool, a butcher, a hospital, and a grand entertainment hall whose acoustics —even today — are remarkable. The mining families of Kolmanskop imported champagne from France. And every day, someone was paid to sweep the streets clear of the sand that blew in overnight. But as quickly as Kolmanskop’s diamond boom began, it ended. By World War I, the area’s diamond deposits were depleted, and another, larger deposit was discovered near the Orange River. The families who once made their homes in Kolmanskop picked up and moved south, leaving homes and possessions behind. The last residents left the town in 1956. 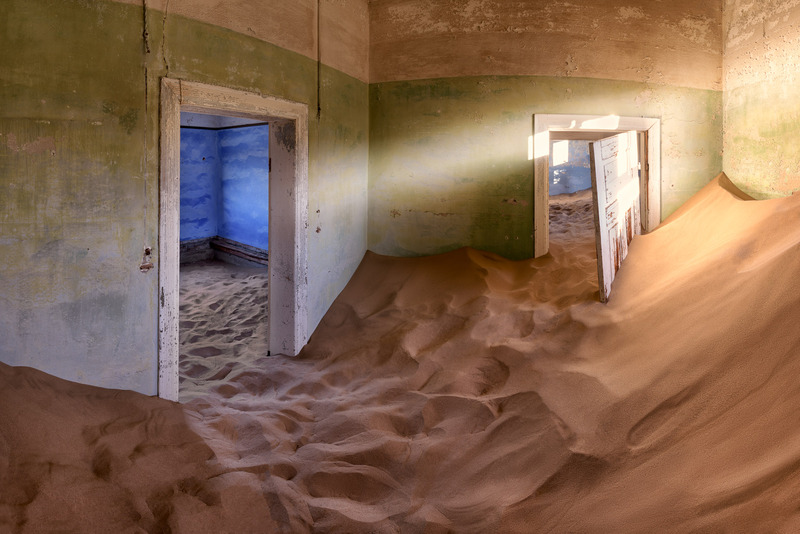 And then the desert began to reclaim Kolmanskop. Without a human presence to keep the desert at bay, the sand began to overtake the once grand homes, filling the parlors, dining rooms, and bedrooms where families once lived. Paint and wallpaper were worn away by sand and by time. To walk among the empty town today is to be reminded that we humans are small, powerless creatures. We build our homes, we live our lives and do what we will. But ultimately, time and nature will have their way with these things, leaving scant traces of our small existence. This entry was posted in City, Interior and tagged Africa, Kolmanskop, Namibia.